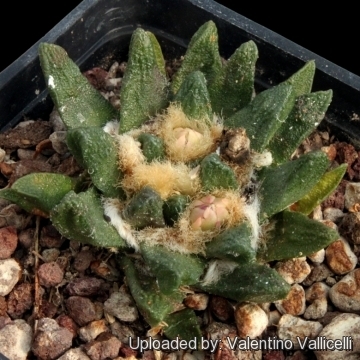 Description: Ariocarpus scaphirostris var. 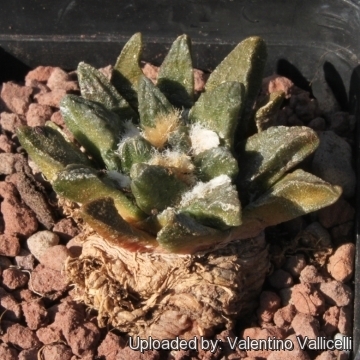 swobodae is a geographical forms of Ariocarpus scaphirostris which differs from the standard species only for its very soft tubercles, but is likely to fall within the natural variation of the species. Habit: It is a small and slow-growing, geophytic cactus rising barely above ground level. Stem: Smaller solitary, subglobose or globose, more or less rounded on top, 3-6 cm in diameter and 2-6 cm tall (occasionally bigger in cultivated plants). Tubercles: Few divergent, erect spineless, not crowded or basally compressed, bluntly pointed at the apexes, very soft, flattened and smooth adaxially, fissured, slightly incurved, 1,5-4 cm long, 5-8 mm broad, at least twice as long as wide, grey wool between the tubercles. Flowers: Diurnal, self-fertile, bright dark purple, up to 4 cm. 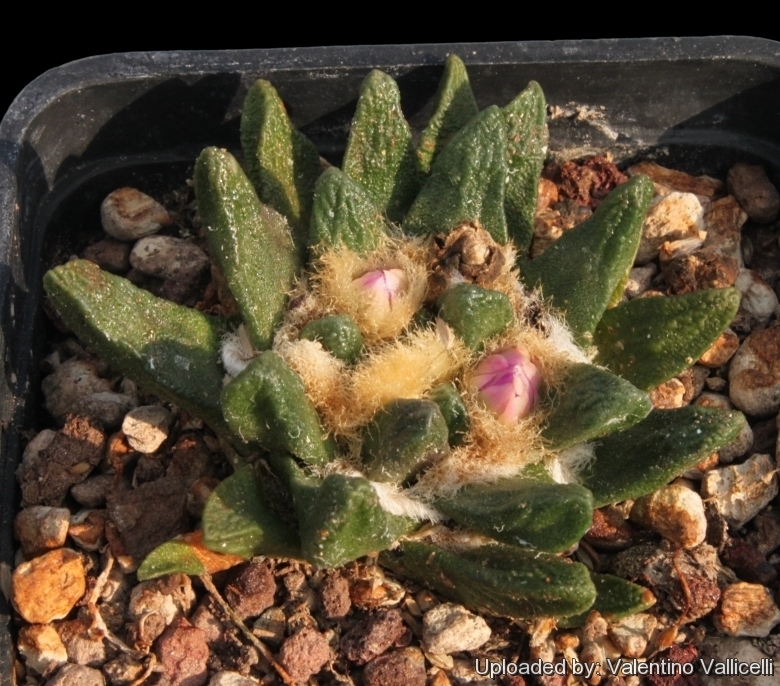 Cultivation and Propagation: Ariocarpus scaphirostrus var. swobodae is not too difficult in a greenhouse, although it grows extremely slowly (it starts blooming at the age of 8-12 years). Repotting: The plants need deep pots to accommodate the napiform unit formed by the stem base and the rootstock. Generally, they should be repotted frequently at least every other year in order to provide fresh soil. However, old plants become senile and have a tendency to succumb to disease and a weak root system. At this stage, as is well known, they die suddenly. So, after they reach 6 cm in diameter grow them slowly, and adopt a new repotting period, using intervals of every 3 years. Additionally grow them under drier conditions or with stronger sunlight. However, repotting doesn't necessarily mean they'll need larger containers.